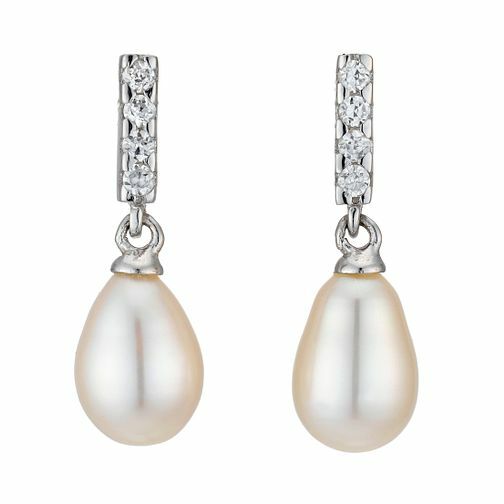 A classic pair of cubic zirconia and cultured freshwater pearl earrings set in silver. Pearl size 7-7.5mm. Silver CZ Cultured Freshwater Pearl Earrings is rated 5.0 out of 5 by 5. Rated 5 out of 5 by Anonymous from Great Purchase Delivery excellent and these earrings are beautiful. Bought for a Christmas gift and I am tempted to purchase some for myself. Nice gift box also no wrapping needed. Rated 5 out of 5 by Anonymous from The picture doesn't do these earrings justice These are stunning. Exactly what I was looking for.